. إن حسن الضيافة والخدمات الراقية التي تعرف بها Wyndham Hotels & Resorts تغني تجربتك في ويندام سيرفرز بارادايس. إن مرافق مخصصة لذوي الاحتياجات الخاصة, تسجيل وصول/خروج سريع, تخزين الأمتعة, واي فاي في المناطق العامة, صف السيارات هي جزء فقط من الخدمات التي تميز ويندام سيرفرز بارادايس عن باقي الفنادق في المدينة. يمكن للنزلاء الاختيار من ضمن مجموعة من الغرف المصممة بعناية لتعكس جواً من الراحة، والتي يتجاوز عددها 192. يقدم الفندق مجموعة رائعة من الخدمات كمثل حوض استحمام ساخن, مركز للياقة البدنية, مسار جولف - ضمن 3 كم, حمام سباحة خارجي, سبا، لجعل إقامتك تجربة لا تنسى. إن كنت تتطلع إلى إقامة مريحة وهادئة في جولد كوست، فستجد في ويندام سيرفرز بارادايس بيتك الثاني. كانت الإقامة رائعة والموقع ممتاز وقريب من الشاطئ والمحلات التجارية ولكن المشكلة حصلت عندما تم تشغيل إنذار الحريق بالخطأ مما أرعب النزلاء. It was just one night we stayed, the room is fantastic, clean and the bed is comfortable. The location is great, close to everything. Unfortunately the pool was close for maintenance at the time, just a little disappointment but we understood. Hi Jordan, Thank you for leaving such a great review in regards to your recent stay with us. We are very pleased to hear you found the apartment clean, the bed comfortable and enjoyed the location. We look forward to welcoming you back in the future. We stayed in a 1-bedroom ocean view apartment. Lovely sea views. Well equipped for longer stays. The sofa bed was a little uncomfortable, so had to share a double bed with our toddler. Staff helpful with arranging airport transfer. Dear Elvira, Thank you for your leaving a great review in regards to your recent stay with us. We are happy you got the chance to experience the amazing sea views from our higher level apartments and found the apartment well equipped. We pride ourselves on a high level of customer service and are pleased to hear you found the staff helpful throughout your stay. Apartment was clean and spacious with a great sea view. Staff were very friendly. Location was only a short walk away from Caville Ave but enough to be away from the rabble. Breakfast was pretty basic so I'd suggest going somewhere else if you like quality and better selection. Hi Craig, Thank you for your fantastic review. We are happy you got to experience our amazing ocean view apartments throughout your stay. We pride ourselves on a high level of customer service and are pleased to hear you found our staff friendly and helpful. Happy travels! Hotel room equipped with fully furnish, love it. Walking distance to Tram station, 15 mins walk to Surfer Paradise beach and Woolworth. Can find few restaurant there. Restaurant next to hotel name Alfresco serve very nice food, get 10% off from the bill if u let them know u stay here. Definitely will come back again. 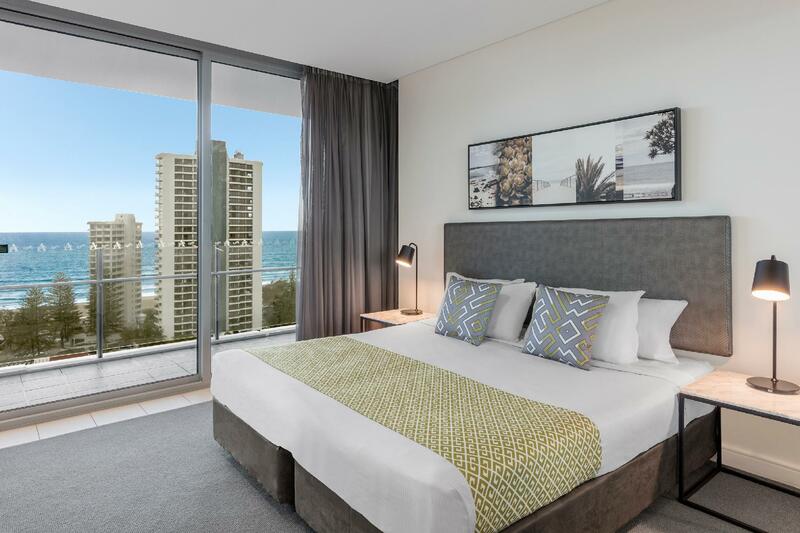 The hotel situated at the surfers paradise, is in walking distance to the beachside. A lots restaurant around the hotel, the carpark is free of charge. The 1 bedroom suite is great enough, the negative side is the wifi is the slow and there is no clean the room in the next day. Great views from the rooms and balcony's . Good sized apartments . Very friendly staff. Good WiFi and free movies . I thought the pool area was a little disappointing after seeing the stunning pics on line . Possibly to many kids for me and not well manned kids as well throwing sand into the pool all day but this is not the hotels fault at all just feral kids . Over all good and i would recommend this hotel. 5-min walk to Surfers Paradise. 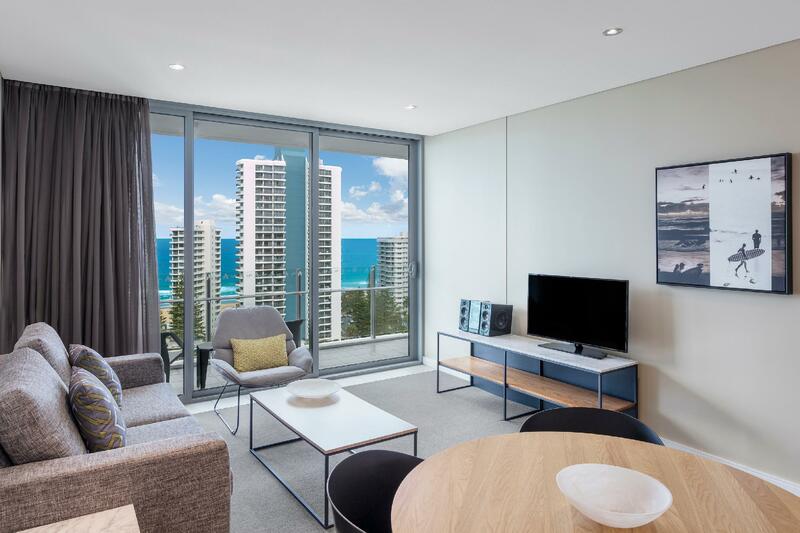 Spectacular view with balcony facing the Surfers Paradise. Friendly staff. Full kitchen is built in. All utensils provided. Free WIFI. Highly recommend for family or group travellers. Great apartment for $199. We had two bedrooms and a large living area along with a funky functioning kitchen. The kitchen included electric stove, microwave, cutlery etc. Excellent. Nice view into the surrounding cityscape. A five minute walk to the beach and also free car park under the hotel. Good hotel. Hello Larisa, thank you taking the time to review your recent stay with us. We are pleased you enjoyed the location of the resort. I apologise for the issues you experienced. I have passed on your comments to our General Manager to review. We hope you will provide us with another opportunity to exceed your expectations in the future. We loved this hotel! It had everything you could want and more. We stayed in a deluxe apartment, complete with utility room (washing machine and dryer), a well- stocked lounge / kitchen and big bathroom. Free wi-fi was more than adequate. Lovely pool and surrounding area. Would definitely stay again. Hi Sue, Thank you for your 10/10 review. 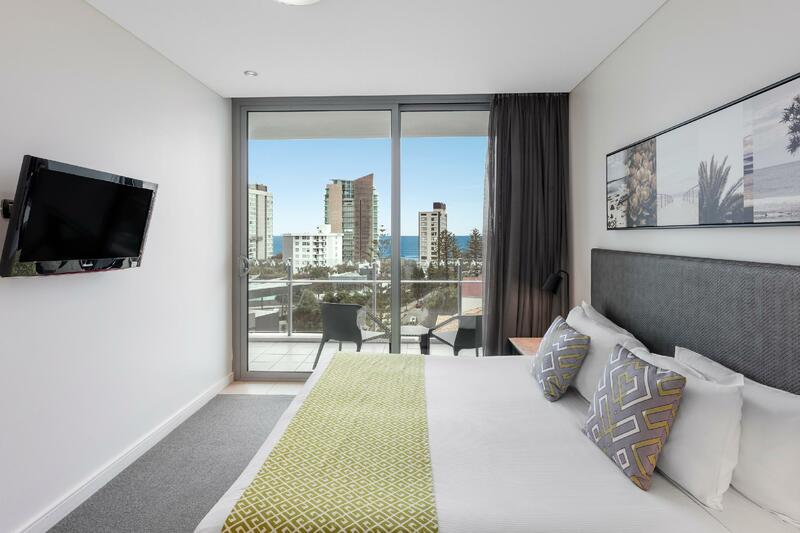 We are so pleased to hear that you absolutely loved your stay at Wyndham Surfers. We agree, its great having the access to a fully equipped kitchen and laundry throughout your stay. We look forward to welcoming you back to the resort soon. We had a lovely experience at the Wyndham hotel. The staff are so lovely and welcoming especially Jo on the front desk. She was absolutely amazing! The room was beautiful as well and perfect for a young family with a 3 month old. Wish we could have stayed longer. Hi Caitlin, Thank you for your lovely review in regards to your recent stay with us. We are pleased to hear you enjoyed the customer service from our staff and have passed on your lovely feedback to Jo on the front desk. We look forward to welcoming you back to Wyndham Surfers in the future. A very nice hotel. Room was large and equipped with kitchen. Unfortunately the oven did not work when we stay there. The tram station is just a few meters away in front of the hotel, which is very convenient for you. Just 200-300 meters away from the beach. Will stay here again if we go to gold coast. One of the most accommodating hotels my partner and I have been to. Staff are superb and friendly especially the morning barista lady who remembered our daily coffee fixes and extra requests. We will definitely stay here again in Gold Coast. This is a serviced apartment with a hotel reception and food area. It was nice to have someone accompany us to our room and help explain where to go and give advice. I think that was in part to sign us up to attend a seminar for the hotel chain, but was not pushy about. Very nice view from the balcony. I have always prefer a studio-like accommodation as I can prepare meals in the hotel when I don't feel like eating out. Hence this one-bedroom hotel is a plus point, which means I didn't have to smell the residue of my cooking when I'm sleeping! One thing if I am to criticise is the tenant has to dispose their own garbage in the garbage room. I'd never came across with something similar to this so I find it a bit weird (and if you don't do that, or you didn't put all the used dishes in the dishwasher, you'll be charged a $25). very equipped apartments. location was fantastic & all the staff memebers very very friendly. Pool area very big & set out liike a beach.Good chioce of dvd's to rent for $10 per night. plenty of parking spaces & free. I just love this place soooooooooo much!!! 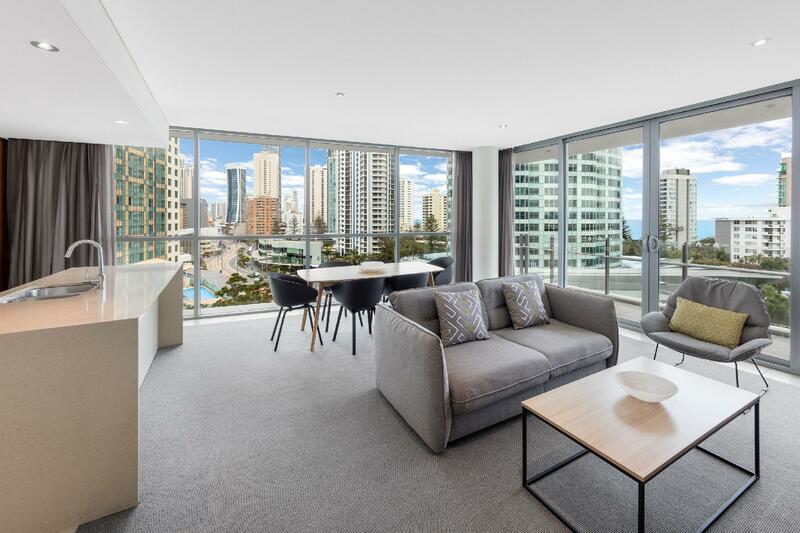 great location, five blocks (10 mins walk) to the shopping mall and the heart of surfers paradise, just a couple of mins walk to the beautiful beach.... I think I will be back sometime in the future! Hotel staff is little cool though, but helpful. Kitchen is fully equipped, we bought some seadfood in the supermarket and had a great meal in the room. Good location of the hotel. Was provided with a sea-view room. 5 minutes to Surfers Paradise beach. Hotel provide free car parking. Room is clean and spacious. However, room makeup service is provided on weekly basis. So if you don't stay over 7 days in the hotel, you need to clean up yourselves. Anyway, room provide all clean up facilities. Only con:Curtain is not thick enough to prevent the sun-light especially in the morning. If you are a light sleeper, please pay attention. Anyway, if so, you can enjoy the fresh morning in Surfers Paradise beach. Will sta with Wyndham Surfers Paradise if I visit Gold Coast again.